November 6, 2018 -- Two of Europe's leading research groups in hyperpolarized and cardiovascular MRI -- ETH Zurich in Switzerland and the Technical University of Munich in Germany -- have joined MetaboliQs, the project funded by the European Union (EU) that is due to continue until the end of 2021. The project is part of Quantum Flagship, which has received funding from the EU's Horizon 2020 research and innovation program. The other partners are the Fraunhofer Institute for Applied Solid State Physics (IAF), Bruker BioSpin, and NVision Imaging Technologies (all from Germany), Element Six (the U.K.-based supplier of synthetic diamonds for cutting, grinding, drilling, mining, polishing, optics, semiconductors, and sensors), and the Hebrew University of Jerusalem in Israel. "This initiative intends to place Europe at the forefront of the second quantum revolution, which is now unfolding worldwide. It aims to bring disruptive quantum technologies to the scientific arena and to society in general by bringing forward new commercial opportunities addressing global challenges, providing strategic capabilities for security and seeding yet unimagined applications for the future," according to a statement issued by the team on 29 October 2018. The ability to personalize cardiovascular medical care and improve outcomes will require characterization of the heart, other organs, and the characterization of tumors at the molecular level, the statement continued. MetaboliQs will combine diamond-based quantum sensing and medical imaging to foster the molecular understanding and personalized care of cardiovascular diseases. 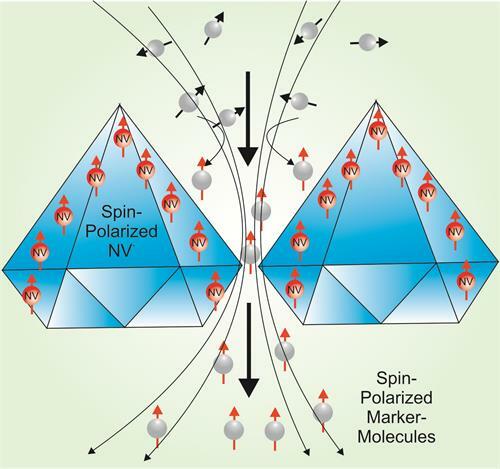 The technique used by the researchers is based on the hyperpolarization of marker molecules like pyruvate used for MRI (NV = nitrogen vacancies). Image courtesy of MetaboliQs. "Because of their limited sensitivity, even the most expensive MRI scanners (with the strongest magnets) cannot detect and visualize molecular and metabolic activity in the heart with sufficient sensitivity and specificity," the project's organizers noted. "To this end, emerging hyperpolarized MRI techniques play a pivotal role as they allow increasing the sensitivity of MRI by up to five orders of magnitude." The hyperpolarization process takes a very long time (90 to 180 minutes per procedure), is extremely costly and cumbersome (more than 1.75 million euros initial cost), and requires temperatures below -270 degrees Celsius. The MetaboliQs project, therefore, aims to enable a new method for MRI by leveraging new advances in quantum physics. Hyperpolarized MRI allows imaging and visualization of key metabolic substrates in the heart and other organs, such as the kidney and liver, via hyperpolarization of nuclear spins of substrates that are natural to the body and nontoxic, allowing a number of important metabolic reactions to be tracked noninvasively, the researchers explained. Hyperpolarization can dramatically increase the signal-to-noise ratio in MRI, and is being applied to small injectable endogenous molecules that can be used to monitor transient in vivo metabolic events in real-time. The emergence of hyperpolarized carbon-13-labeled probes -- specifically C-13 pyruvate -- has enabled monitoring of core cellular metabolic events. Neuro-oncological applications have been demonstrated in preclinical models, and they might transform MRI in the future, wrote New York neuroradiologist Dr. Vesselin Z. Miloushev, PhD, in an article in Topics in Magnetic Resonance Imaging about the technique. "The promise of hyperpolarization technology is to harness the unique ability of nuclear magnetic resonance spectroscopy to distinguish chemical moieties on the basis of chemical shift and to characterize their dynamic properties in vivo," he noted. "Many more applications are envisioned that can harness the unique power of this technology." Hyperpolarized carbon-13 MRI is a functional technique that works by probing perfusion and metabolism using injected substrates. It provides chemical as well as spatial information, and is being used to probe the activity of specific metabolic pathways. The technology will enable a previously unachievable, highly sensitive quantification of metabolic activity, paving the way for precision diagnostics and better personalized treatment of cardiovascular diseases, the MetaboliQs statement added. For example, it will become possible to distinguish patients who are most likely to benefit from invasive or pharmacologic cardiac interventions from those who will need other medical treatment, and to accurately diagnose patients at the disease's early stages. "The project will leverage the transformative features of diamond nitrogen vacancies, such as high quantum coherence and quantum control, to offer a breakthrough in cardiac hyperpolarized MRI: A low cost and high-throughput diamond polarizer that can be used with any MRI scanner and show results within minutes instead of hours required per procedure," the group stated. "This unique utilization of quantum coherence is made possible by new technology to atomically engineer diamond material (quantum-grade diamond), including C-12 isotopic purification, precise control of nitrogen defect concentration, and nanofabrication of the diamond surface." The MetaboliQs consortium, through its combination of leading research institutes and innovative companies, provides the end-to-end expertise required to reach the ambitious objectives of the project and develop breakthrough capabilities in hyperpolarized MRI for cardiovascular applications, according to the statement. The research of the Fraunhofer IAF is organized into four specialist departments: epitaxy, technology, microelectronics, and optoelectronics. There is a close exchange between these units as well as cooperation across departments in most research projects. All departments are organized into four to six teams. Additionally, there are two infrastructural departments at the facility (administration and technical services) as well as two groups (information technology and quality management). To target industry clients and partners, political actors, as well as partners in science, Fraunhofer IAF focuses its research activity on five business units: high-frequency electronics, power electronics, photodetectors, semiconductor lasers, and diamond devices.